It’s August and it’s nearly time for all of America’s kids to go back to school. Stay safer with these tips provided in part by First Student and the National Safety Council. 1. Leave plenty of time to arrive safely at the bus stop. 2. Stay alert while traveling to the bus stop – don’t text, listen to loud music in your headphones, playing video games etc. 3. Stay away from the street and follow all traffic safety rules. 4. Stay 12 GIANT steps away from you and the bus at the bus stop so that the bus drivers will ALWAYS see you. 5. Know your driver’s name and bus driver to make sure you board the right bus. 6. When the bus arrives, let it stop completely before approaching it. 7. Always use the handrail when climbing the bus stairs, and sit down immediately. 8. Buckle up if your bus has seat belts! If your bus doesn’t have seat belts, let your school teachers, officials and family members know — and read why there needs to be seat belts on school buses here. 8. Be courteous and respectful to your bus driver, and talk quietly with your friends — don’t yell, or the driver will become distracted. 9. Keep your arms, legs, papers, and anything that belongs to you inside the bus at all times. 10. Be aware, alert and safe! 1. Slow down when you see flashing yellow lights from the school bus, and stop when they use their flashing red lights/stop arm. You are required by law to stop on BOTH sides on the street when these red lights are lit and/or when the stop arm is extended. 2. 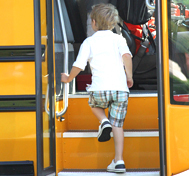 Do not attempt to pass a stopped school bus that is loading or unloading children, no matter where it is. 3. Do not text and drive, or drive while distracted.